Leah Hogsten | The Salt Lake Tribune Brigham Young Cougars offensive lineman Corbin Kaufusi (90) swats SUU's 49-yard field goal attempt. Brigham Young University defeated Southern Utah University 37-7 during their first match up at LaVell Edwards Stadium, Saturday, November 12, 2016. A fourth BYU football player was named to a preseason watch list on Tuesday, as defensive end Corbin Kaufusi was selected by the Football Writers Association of American to the 2018 Bronko Nagurski Trophy watch list. The Nagurski Trophy goes to the most outstanding defensive player in college football. Kaufusi is one of 97 players from 61 schools and all 10 Division I FBS conferences on the list. 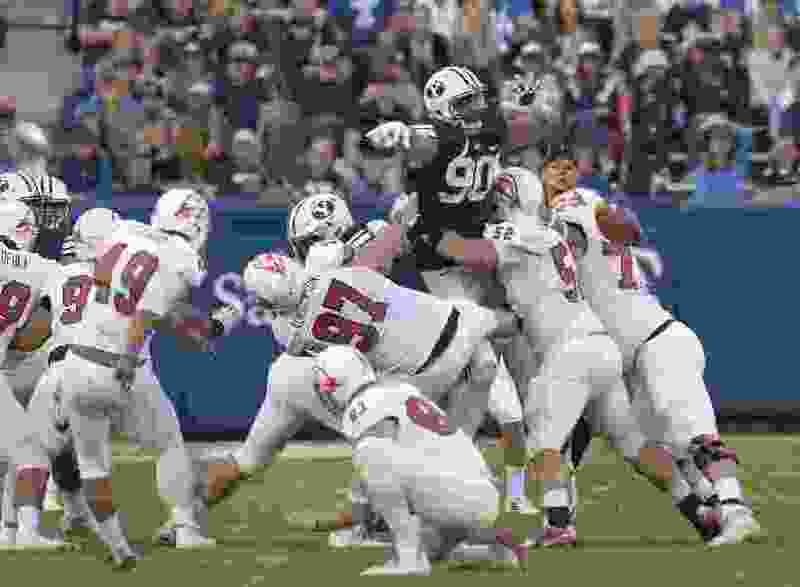 The 6-foot-9 Kaufusi, who played basketball for BYU earlier in his career, led the Cougars with six sacks last season, and also made 67 total tackles. He’s one of 24 defensive ends on the list. Last week, BYU tight end Matt Bushman, running back Squally Canada and quarterback Tanner Mangum received preseason recognition. Bushman was named to the 2018 John Mackey Award preseason watch list on Friday. The award is given annually to the most outstanding tight end in college football. Bushman led all freshman tight ends in 2017 with 49 catches for 520 yards and earned Freshman All-America honors from USA Today, the FWAA and 247sports.com. It was the most production from a BYU tight end since Dennis Pitta caught 62 passes for 829 yards in 2009. A senior, Canada was named to the 2018 Doak Walker Award preseason watch list last Wednesday. The Walker Award goes to the country’s top running back. Canada, from Milpitas, Calif., led BYU in rushing last year with 710 yards and six touchdowns. His 213-yard performance against UNLV ranks No. 10 in school history. Former BYU running back Luke Staley won the Walker Award in 2001 after rushing for 1,582 yards and 28 touchdowns. Mangum, also a senior, was named to the 2018 Allstate AFCA Good Works Team. Student-athletes who demonstrate a unique dedication to community service, make a positive impact on those around them and show tremendous perseverance to overcome personal struggles are nominated for the award. Mangum has been an advocate for mental health awareness after publicly acknowledging his own struggles with mental health issues last year. He has started in 21 games for BYU, including 12 as a freshman when he became the first BYU freshman to reach 3,000 passing yards in a season. At least five more watch lists are scheduled to be released this week, including the Lou Groza (best kicker), Ray Guy (best punter), Paul Hornung (most versatile player), Wuerffel (community service and academics) and Walter Camp (best player) awards.